The hunt is on. 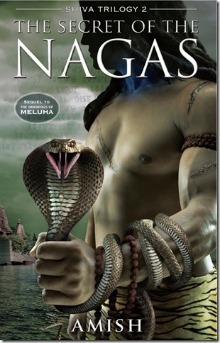 The sinister Naga warrior has killed his friend Brahaspati and now stalks his wife Sati. Shiva, the Tibetan immigrant who is prophesied destroyer of evil, will not rest till he finds his demonic adversary. His vengeance and the path to evil will lead him to the door of the Nagas, the serpent people. Of that he is certain. The evidence of the malevolent rise of evil is everywhere. A kingdom is dying as it is held to ransom for a miracle drug. A crown prince is murdered. The Vasudevs - Shiva's philosopher guides- betray his unquestioning faith as they take the aide of the dark side. Even the perfect empire, Mehula is riddled with a terrible secret of Maika, the city of births. Unknown to Shiva a master puppeteer is playing a grand game. In a journey that will take him across the length and breadth of ancient India, Shiva searches for the truth in a land of deadly mysteries - only to find that nothing is what it seems. Fierce battle will be fought. Surprising alliances will be forged. Unbelievable secrets will be revealed in this second book of the Shiva Trilogy, the sequel to, The Immortals of Mehula. I started reading this book right after reading The Immortals of Mehula. The story is very much connected to the first book and it starts right from the point where it was left in the the first book. In 'The Immortals of Mehula' a lot of time is devoted to sketching the characters, depicting the places, setting the plots etc. There were many loose threads in the story and a lot of secrets. The Secret of the Nagas is more action packed in that regard, with things happening fast, secrets revealed, battles fought, it was a page turner right from the beginning till the end. The identity of the Naga queen and the Naga warrior was quite a revelation, but I could guess about the secret of the Nagas. I don't want to delve deeper into the plot here as the blurb says a lot about how the story progresses in this book. I have read in many reviews that readers were disappointed with the language in the book. It is simple and amateurish. I have no such qualms. I was looking for an easy, fast and action packed book. The book delivered on all areas for me. I am hoping all loose threads and unanswered questions will be addressed in the next part of the trilogy. Eagerly waiting for the third book of the trilogy - The Oath of the Vayuputras.